The Rare Books & Manuscripts Section has recently acquired two obstetrical texts — both published the same year. 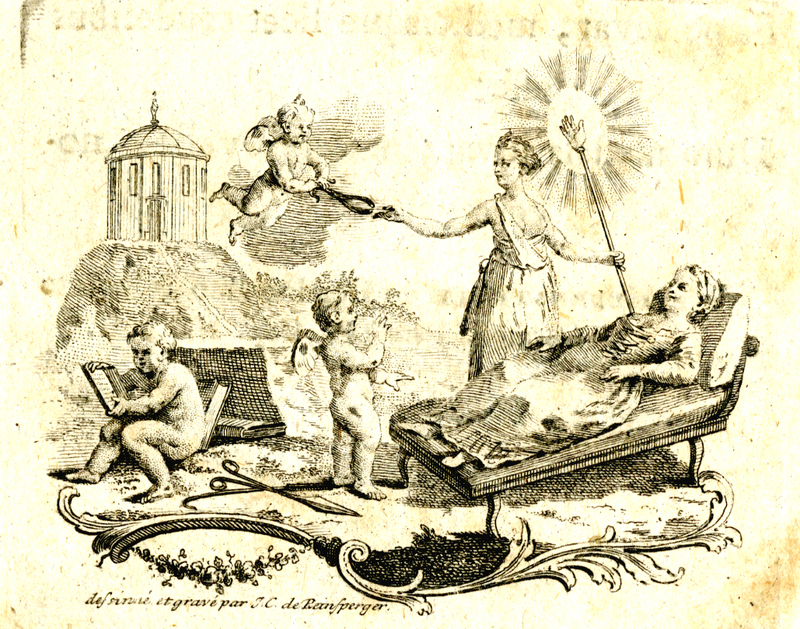 From a Paris bookseller, we recently purchased Michel Chevreul’s (1754-1845) Précis de l’art des accouchements, a summary of child-bed delivery written for the instruction of midwives published at Angers in 1782. We know little about the author, other than the fact that he was a physician and surgeon in Angers (Maine-et-Loire dept.) and that he inspected the activity of midwives in the Généralité de Tours. Curiously, the boards and backstrip of this volume are covered with part of a vellum leaf from a volume of Gregorian chant. The author of our second acquisition, Raphael Johann Steidele (1737-1823), was a well-known surgeon and obstetrician in Vienna and the author of several obstetrical treatises. From a bookseller in Copenhagen, we purchased Steidele’s Abhandlung von dem unvermeidenlichen Gebrauch der Instrumente in der Geburtshülfe (A treatise on the unavoidable use of instruments in obstetrical delivery) published at Vienna in 1782. The allegorical vignette on the title-page of Steidele’s Abhandlung depicts Lucina, the Roman goddess of childbirth, presiding over the delivery of a young woman reclining on a couch. The goddess is assisted by putti who hand Lucina an obstetrical forceps and other instruments used in delivery. The treatises of Chevreul and Steidele have been added to the Miner LIbrary’s collection of rare obstetrical books — a collection numbering more than 600 titles, a third of which were published before 1800. This entry was posted on Saturday, April 27th, 2013 at 10:34 AM and is filed under All News, History of medicine. You can follow any responses to this entry through the RSS 2.0 feed. You can leave a response, or trackback from your own site.